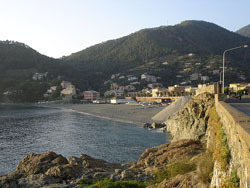 The village is located in a bay on the eastern Ligurian coast. Founded on a flood plain and extended for about five kilometres, the region consists of eight historical villages. The economy of Bonassola is obviously based on tourism, being in close proximity of the tourist destination of Cinque Terre. On the hills around Bonassola visitors can find also many vineyards and olive groves. On 1st June, in order to celebrate Corpus Christi, the city streets are filled with markets, decorated with floral mosaics and it’s possible to enjoy many fun events and entertainment. Since time immemorial, in August Bonassola offers a unique show of its kind: the award for the UCCA. It is a riotous celebration during which a group of masked parades through the streets of the village, reaches the sports field and in front of a few thousand people starts to tease those who stood out during the year by doing things especially outside by the municipality. It was finally elected the most eccentric person, actually called "UCCA". All in rhyme and in a language which includes Latin, Bonassola and Genoa dialects. The event is organized by the " Master of Curnea". On the first Sunday of October, Bonassola organizes the feast of Our Lady of the Rosary, with a procession from Our Lady of Punta the parish of St Catherine of Alexandria, and reaches the sea where you can enjoy fireworks.